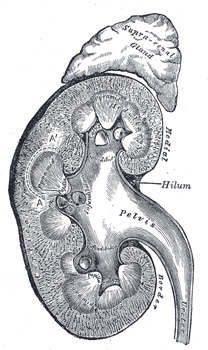 Kidneys are two organs in the abdomen of vertebrates that are shaped like beans. They make urine (the yellow waste water that comes out of the urethra.) They are part of the urinary system. When medical professionals discuss the kidneys, they typically refer to the word renal. For example, renal failure is when the kidneys are sick and do not work. The prefix nephro- is also used in words to mean "kidneys". For example, a nephrologist is a doctor who studies kidneys. The kidney makes hormones. The two most important ones that it makes are erythropoetin and renin. Erythropoetin is made by the kidneys if there is less oxygen in the kidney. Erythropoetin tells the bone marrow to make more red blood cells. So this means there will be more oxygen carried in the blood. Renin is made by the kidney if there is low blood pressure, low volume of blood, or too low salts in the blood. Renin makes the blood vessels smaller and tells the adrenal gland to make aldosterone (which tells the kidneys to save salts). It also makes a person feel thirsty. All of this makes the blood pressure go up. The kidney's most important work is keeping homeostasis. Homeostasis means that the body keeps a stable environment inside itself. The body needs to have the consistent and proper amount of water, salt, and acid in the blood. The kidney keeps these things constant. If there is too much water, the kidney puts more water in the urine. If there is not enough water, the kidney uses less water in the urine.This is why people make less urine when they are dehydrated. There are many types of kidney diseases. A kidney disease makes the kidneys unable to work perfectly but they do work in part. People can have mild kidney failure and have no symptoms. As long as it does not become worse, people may not even know they have it. Severe kidney failure means very bad failure. The kidneys do not work very much at all. People with severe kidney failure always have symptoms. They may need special care from doctors. Kidney stones – this is when a solid substance forms in the urine. This stone moves through the urinary system until it cannot go on and gets stuck. This sometimes blocks urine flow. It usually causes severe pain. After a time, the stone usually goes out or passes. If it does not go out, doctors may have to remove it. Kidney infections – also called pyelonephritis. This is a bacterial infection in the kidneys. Some of the symptoms are back pain, vomiting, fever, and dark or bloody urine. People with pyelonephritis need strong antibiotic medicines. Glomerulonephritis – this is a disease of the tissues in the kidneys that make urine. These are called glomeruli. Glomerulonephritis is an autoimmune disease. It can cause mild or severe kidney failure. Congenital kidney disease – this is when people are born with kidneys that do not work properly. This includes people that are born with kidneys in the wrong place, or in the wrong shape. About 1% of people are born with only one kidney. Polycystic kidney disease – this is an inherited disorder in which cysts grow in the kidneys, and destroy the kidney tissue until the kidneys can no longer perform their functions. Hypertensive nephropathy – this is caused by having hypertension (high blood pressure) for a long time. Many people have hypertensive and diabetic nephropathy together. Cancer – Renal cell carcinoma is the most common kind of kidney cancer. It is most often found in adults. It is usually deadly. It is hard to stop it with radiation treatments or chemotherapy. If a person's kidneys do not work properly, they are very sick. If they have severe kidney failure, they cannot live unless they have a replacement for their kidneys. There are two ways to replace the kidneys: dialysis and transplantation. Dialysis is when doctors use a machine and medicines to do the work of the kidneys. There are two kinds of dialysis: hemodialysis and peritoneal dialysis. Peritoneal dialysis is when doctors put a plastic tube into the person's abdomen. Every day the person fills the abdomen with fluid. The extra salts, waste, and water that the body does not need goes into the fluid. Then the fluid comes out and takes the wastes with it. This does part of the job that kidneys do. Hemodialysis is when doctors take blood from a person, clean the blood with a special kind of filter, called a haemodialyser, and put it back in the person. When the blood is cleaned; water, salts and wastes are taken out of it. This must be done 2–4 times every week (usually 3 times.) It takes 2–4 hours to do this each time. Hemodialysis and peritoneal dialysis are not perfect. They do some of the work of the kidney, but it is not as good as a real kidney. So people who need dialysis are not as healthy. They must take medicines. For example, in kidney failure, the kidneys do not make any erythropoetin. Doctors have to give people erythropoetin so they make enough red blood cells. A better way to do the kidneys' work is to give the person another kidney. This is called a kidney transplant. Kidney transplants are the most common type of organ transplant. It is the most common because we have two kidneys, but only need one kidney to live. People who are alive can donate a kidney to another person. Even transplanted kidneys are not the same as kidneys people were born with. A person who gets a renal transplant must take strong medicines to stop their body from attacking the new kidney. Sometimes, after years, the transplanted kidney stops working. But sometimes a patient can get a new transplanted kidney after the first one stops working. It was widely believed in Europe that the conscience was actually located in the kidneys. This idea was taken from the Hebrew Bible. In modern times, medical scientists have shown kidneys do not have this kind of psychological role. This page was last changed on 28 March 2019, at 17:44.